Marker is the only supplier that offers a non-tourable binding that can accommodate BOTH alpine and AT boots safely. A unique pin system allows the toe to be set in either of two distinct positions, and then the fine adjustment can be made via the AFD height adjustment screw found on many of our other Royal Family models. 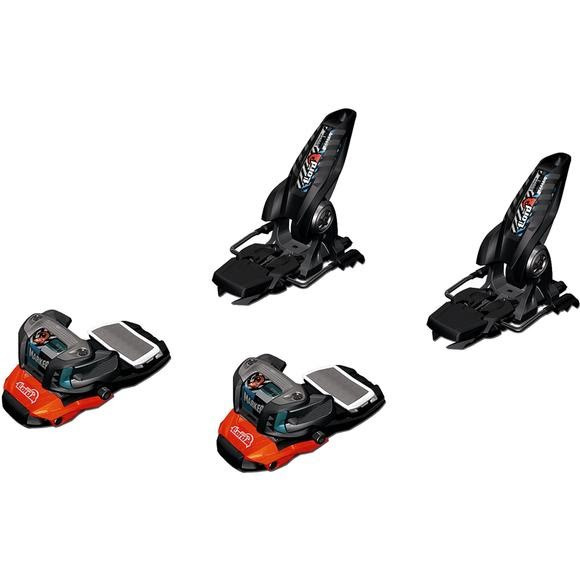 The only non climbing-enabled binding able to safely accomodate BOTH ALPINE and AT boot soles. With a horizontally oriented spring, the Triple Pivot Elite Toe provides the highest energy absorption to reduce the risk of early release. The secure purchase on the boot lug optimizes power transmission and allows for durable, high energy use. The performance to weight ratio of the Triple Pivot toe is truly unmatched in the industry. All Marker bindings are equipped with a moveable AFD (anti friction device), allowing a precise release, unhindered by dirt, snow and ice buildup. The type of AFD is matched to the skier type, ensuring perfect functionality - from racing to junior bindings and even ski touring. his industry-leading construction delivers superior holding power for all types of freeskiing. Its design focuses power in the direction of the boot sole, increasing elasticity. The overall design focuses on optimum power transmission. Magnesium&apos;s light weight and hight strength make it perfect for our high-end products - the skier well equipped for a faster run and the most radical lines!